Dreamland BBQ has been serving the good folks of Tuscaloosa, Alabama with the finest pork ribs in the South since 1958. Now, you can enjoy the flavor of their delicious Dreamland BBQ sauce on your ribs, butts, chicken or whatever your heart desires. Mr. John "Big Daddy" Bishop started Dreamland in 1958 and little has changed since then......no wonder people all over the South exclaim, "Ain't Nothing Like Em, Nowhere!" Get you some Dreamland BBQ Sauce!! 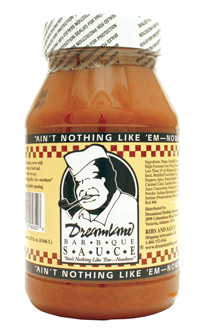 Our family has used, ladled, tasted, and enjoyed Dreamland Barbeque Sauce since 1979. No reason to stop now even though we are 5,000 miles away from Alabama. If I could give this sauce more than a 5 I would! My wife and I treated ourself to the gift basket of BBQ Joints Across America, this is the first one we have tried and I just ordered two more jars!! The sauce is great especially when your tired of the same old BBQ sauces. This one has a great tangy zip that keeps you comin back for more, we even dipped our steamed veggies in it!! Water, distilled vinegar,high fructose corn syrup, tomato paste, less than 2% of: molasses, salt, mustard seed, modified food starch, sugar, hot peppers, spice, natural smoke flavor, citric acid, caramel color, xantham gum, lemon juice concentrate, onion and garlic powder, sodium benzoate and potassium sorbate (perservatives), tumeric, and FD&C Red #40.